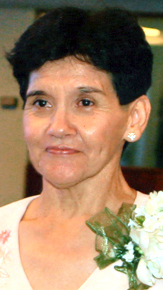 Services are scheduled for 2 p.m. Friday, Feb. 24, at Trinity Temple Assembly of God for Anita L. Almanza of Artesia. Almanza, 66, passed away Monday, Feb. 20, 2017, in Albuquerque. Interment will follow the services at Twin Oaks Memorial Park. Pallbearers will be Victor Daniel Contreras, Mark Leyva, Michael Ramon Leyva, Nathaniel Turrietta, Victor Contreras and Eddie Miller. Anita was born June 1, 1950, in Presidio, Texas, the daughter of Marcos and Margarita (Flores) Leyva. She was a longtime resident of Artesia. On Jan. 12, 1967, she married Paul Almanza in Artesia. Anita was a housewife and member of the Cielos Abiertos Church in Roswell. She enjoyed baking, camping, fishing, reading her Bible every day, and spending time with her family. Survivors include her husband, Paul Almanza, of Artesia; stepsons Rodney Almanza and Mark Almanza, both of Artesia; brothers Ruben F. Leyva and wife Nora, and Michael E. Leyva and wife Rosemary, both of Artesia; sisters Susana Contreras and husband Victor, and Mary Helen Leyva, both of Artesia; brothers-in-law Jimmy Almanza of Roswell and John Almanza of San Diego, Calif.; and numerous nieces and nephews. She was preceded in death by her parents; son Alex Almanza; and stepson Paul Almanza.